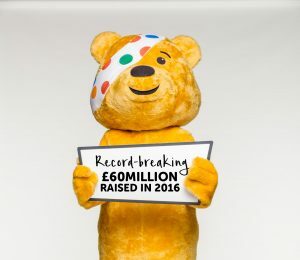 BBC Children in Need announces highest ever fundraising total: £60 million! The charity thanks the public for helping to change the lives of disadvantaged children and young people across the UK. Today (Thursday 6 July 2017) BBC Children in Need announced its final fundraising total for the 2016 Appeal, a record-breaking £60 million. The charity said that the incredible total would not have been possible without the public once again coming together to help raise money to change the lives of disadvantaged children and young people. The 2016 total grew to £60 million as donations and fundraising income continued to pour in following BBC Children in Need’s 2016 Appeal show which culminated with an on-the-night total of £46.6million. The spectacular 2016 Appeal show included incredible musical performances from the likes of Little Mix, Busted and Craig David as well as a Fantastic Beasts special, a kid’s edition of Would I Lie To You and much more. The 2016 total is the highest amount of money raised by the charity in its history and is the culmination of the efforts of every single person across the UK who did something to raise money, from cake baking to sky diving. The money raised will go to projects working in communities throughout the UK to positively impact the lives of disadvantaged children and young people. BBC Children in Need is currently supporting 154 projects in communities around Wales with a total of £9.6million working hard to change the lives of children and young people facing a range of disadvantages such as living in poverty, being disabled or ill, or experiencing distress, neglect or trauma. In the last year alone, BBC Children in Need has been able to make a real difference to 480,000 young lives in communities the length and breadth of the UK. To celebrate the new announcement children and young people who attend BBC Children in Need funded projects across Wales; Organised Kaos in Neath and Port Talbot, Media Academy Cardiff (MAC) and Displaced People in Action (DPIA) in Cardiff, feature in a film to thank fundraisers whose generosity is helping them overcome their challenges and making a difference to their lives. 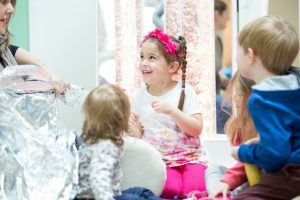 MAC has been allocated a three year grant of over £119,000 to deliver sessions in music, drama, media, and arts for children and young people experiencing disadvantage. DPIA has been allocated £106,000 in funding from BBC Children in Need over three years to provide play sessions and activities for refugee and asylum seeker children and young people to support integration, have better family relationships and improve their confidence and self-esteem. Whilst Organised Kaos Youth has been allocated £30,000 from BBC Children in Need to provide circus skills sessions to children and young people living in areas of deprivation in Neath and Port Talbot. Highlights from the 2016 campaign include BBC Radio 2’s amazing fundraising efforts spearheaded by Chris Evans’ Breakfast Show which saw millions raised through CarFest and the Breakfast Show’s incredible auctions, Countryfile’s 2016 calendar and Ramble weekends, The One Show’s Rickshaw Challenge and a concert in honour of Sir Terry Wogan. BBC TV and radio stations across the Nations and Regions threw themselves into fundraising whilst the charity’s corporate partners, including Lloyds Banking Group, Asda and Boots UK, once again galvanised customers and staff to support Pudsey. And of course, the hundreds and thousands of people across the UK who supported the charity in many different ways. BBC Children in Need currently funds over 2,400 projects and in 2016 allocated £61 million in grants to projects working with disadvantaged children and young people the length and breadth of the UK. 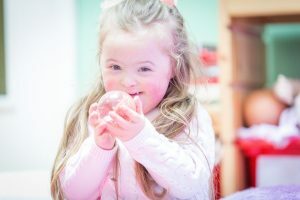 Projects currently receiving funding include Touchdown Dance in Sale, Manchester which benefits from a three-year grant of £69,500 to provide therapeutic dance and arts activities for young people with sensory, physical and emotional disabilities in Greater Manchester and Merseyside. In Scotland, Glasgow based DASH Club benefits from a three-year grant of £141,900 to provide weekly drama, sports and recreational sessions to disabled children and young people in the area. In Wales, Medrwn Môn in Ynys Môn receive a three-year grant of £110,994 to support the development of a Youth Council for disadvantaged and isolated children and young people in the area and in Northern Ireland, The Fostering Network NI receives a three-year grant of £79,799 to deliver support to children and young people across Northern Ireland that are in kinship care. For more information about BBC Children in Need, please visit www.bbc.co.uk/pudsey.